IECC 2006 Issues and Solutions Code Overview and Issue Solving Products. 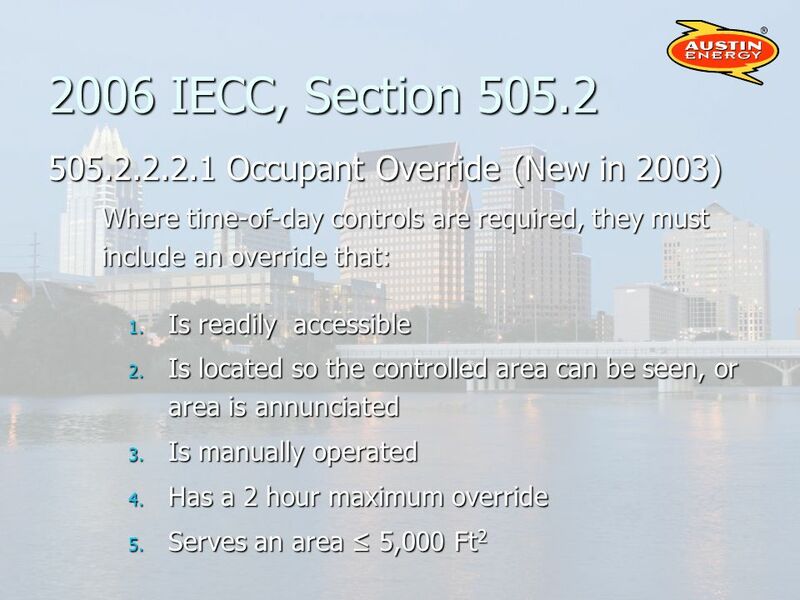 8 2006 IECC, Section 505.1 Section 202 GENERAL DEFINITIONS Dwelling Unit. 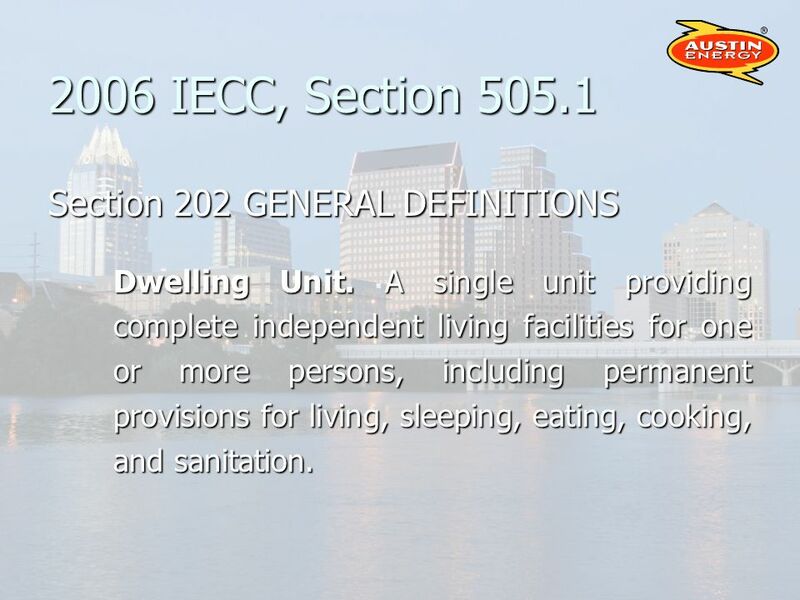 A single unit providing complete independent living facilities for one or more persons, including permanent provisions for living, sleeping, eating, cooking, and sanitation. 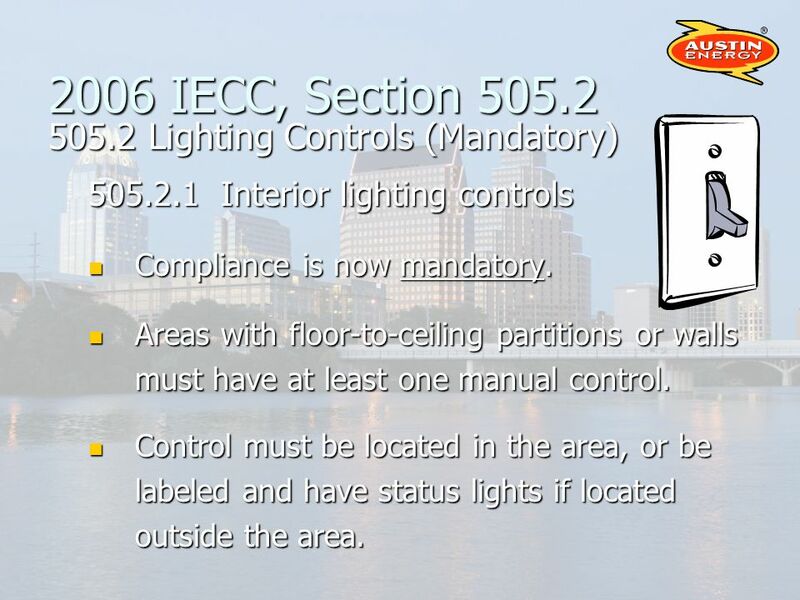 9 2006 IECC, Section 505.2 505.2 Lighting Controls (Mandatory) 505.2.1 Interior lighting controls Compliance is now mandatory. Compliance is now mandatory. Areas with floor-to-ceiling partitions or walls must have at least one manual control. Areas with floor-to-ceiling partitions or walls must have at least one manual control. Control must be located in the area, or be labeled and have status lights if located outside the area. Control must be located in the area, or be labeled and have status lights if located outside the area. 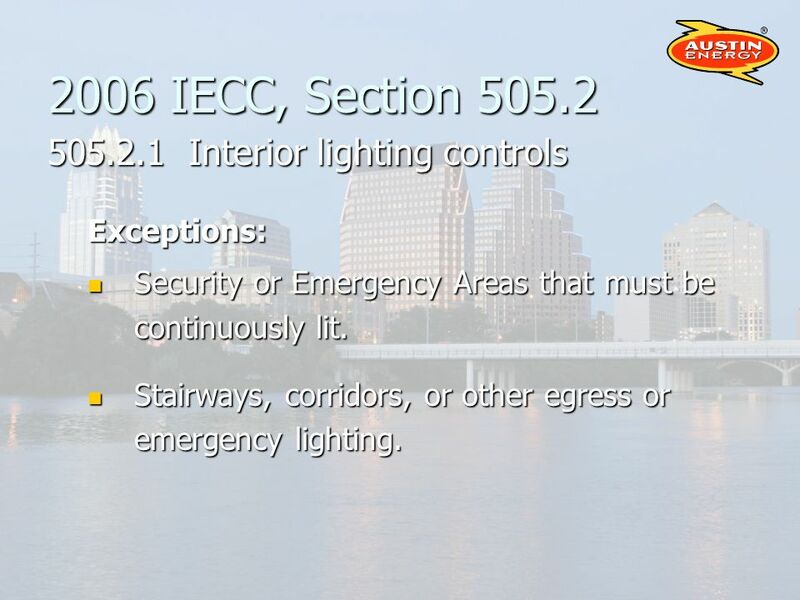 10 2006 IECC, Section 505.2 505.2.1 Interior lighting controls Exceptions: Security or Emergency Areas that must be continuously lit. 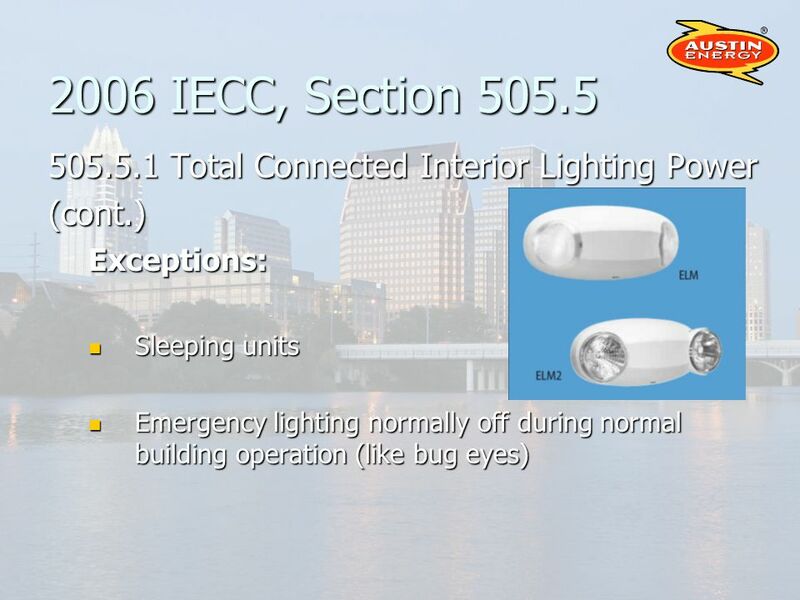 Security or Emergency Areas that must be continuously lit. Stairways, corridors, or other egress or emergency lighting. Stairways, corridors, or other egress or emergency lighting. 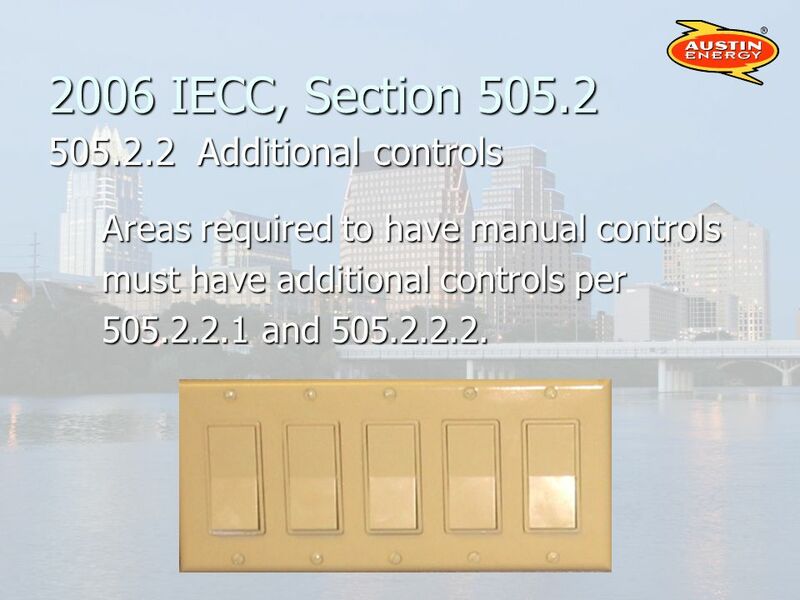 11 2006 IECC, Section 505.2 505.2.2 Additional controls Areas required to have manual controls must have additional controls per 505.2.2.1 and 505.2.2.2. 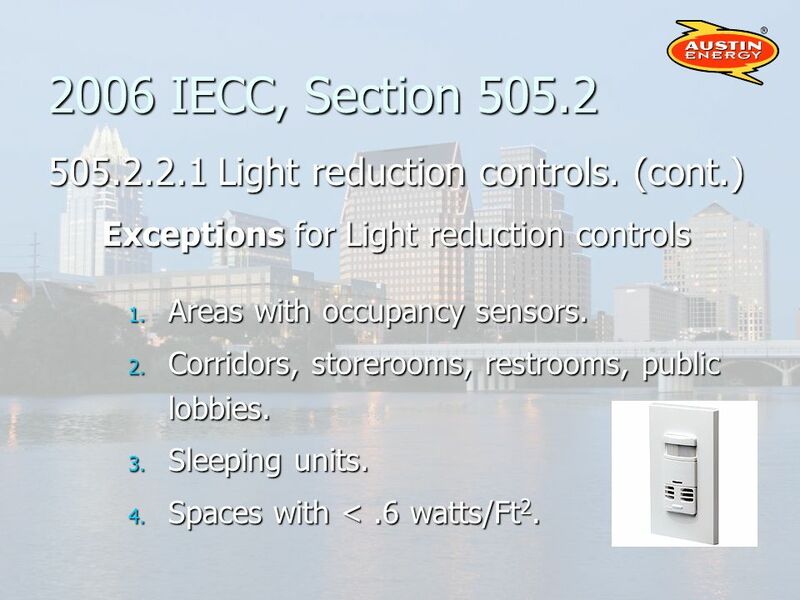 12 2006 IECC, Section 505.2 505.2.2.1 Light reduction controls. 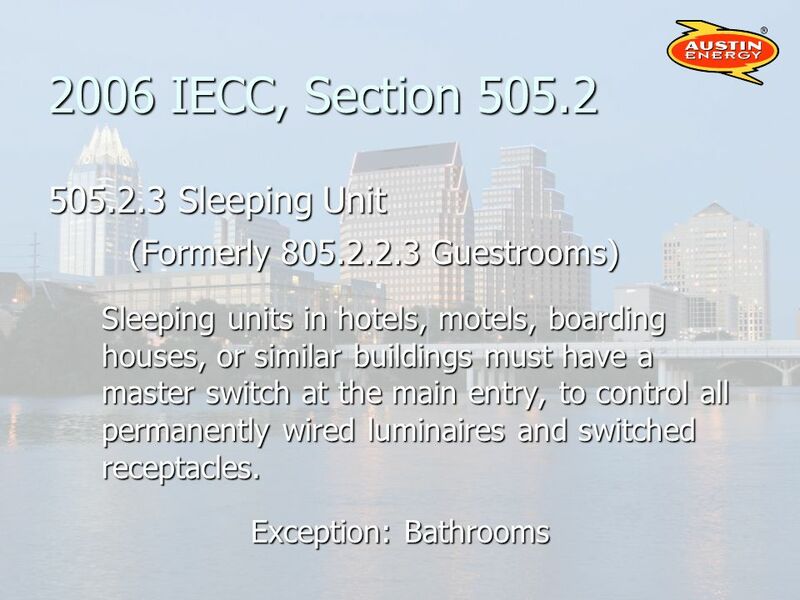 All areas with required manual controls shall allow the occupant to uniformly lower light levels by at least 50%. 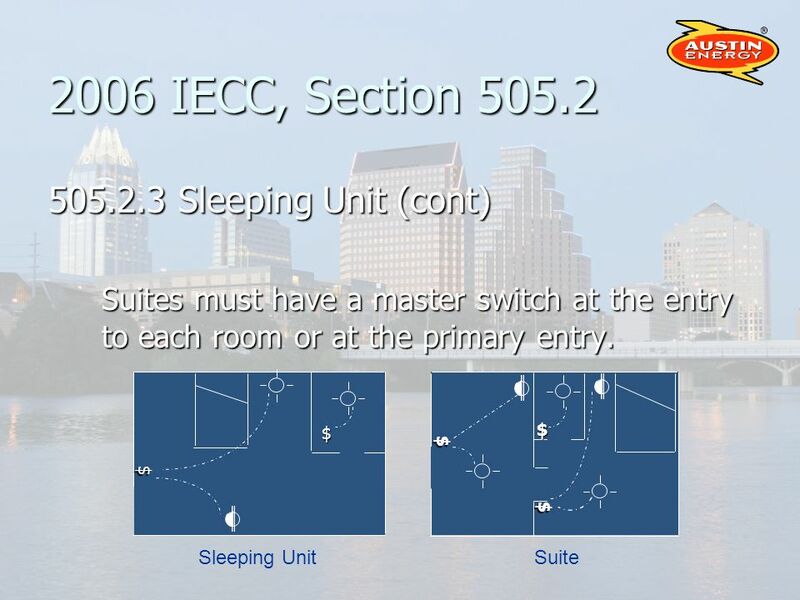 All areas with required manual controls shall allow the occupant to uniformly lower light levels by at least 50%. 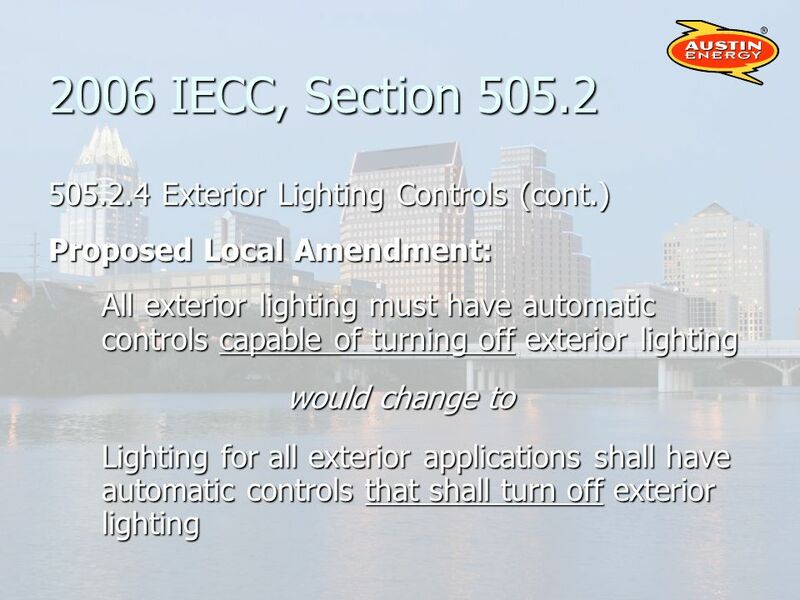 13 2006 IECC, Section 505.2 505.2.2.1 Light reduction controls. (cont.) 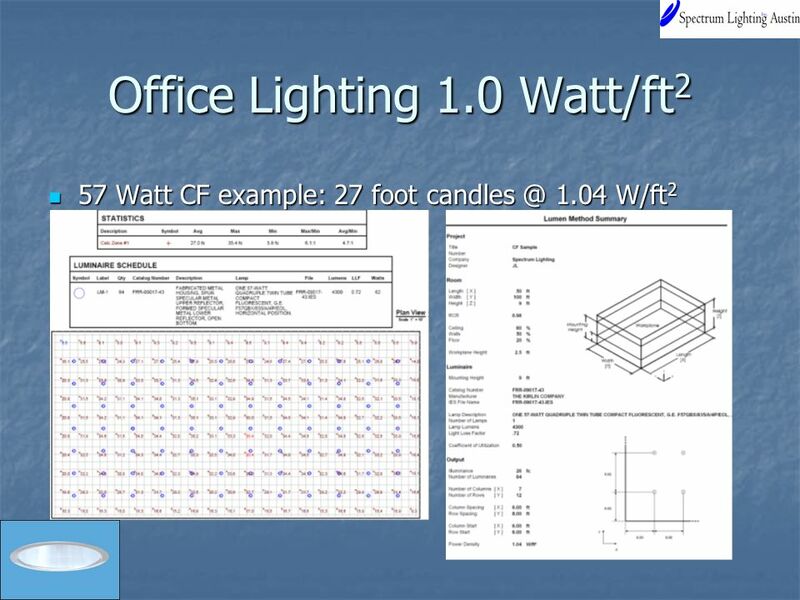 Methods for reducing light levels: Switching all lamps or luminaires. Switching all lamps or luminaires. Dual Switching. Dual Switching. Inboard/outboard switching. Inboard/outboard switching. Switching each luminaire or lamp. Switching each luminaire or lamp. 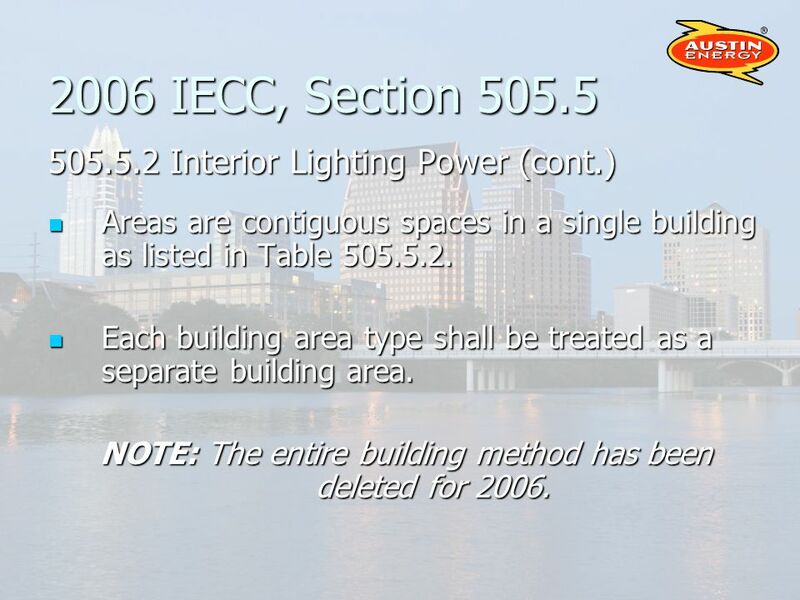 14 2006 IECC, Section 505.2 505.2.2.1 Light reduction controls. (cont.) Exceptions for Light reduction controls 1. 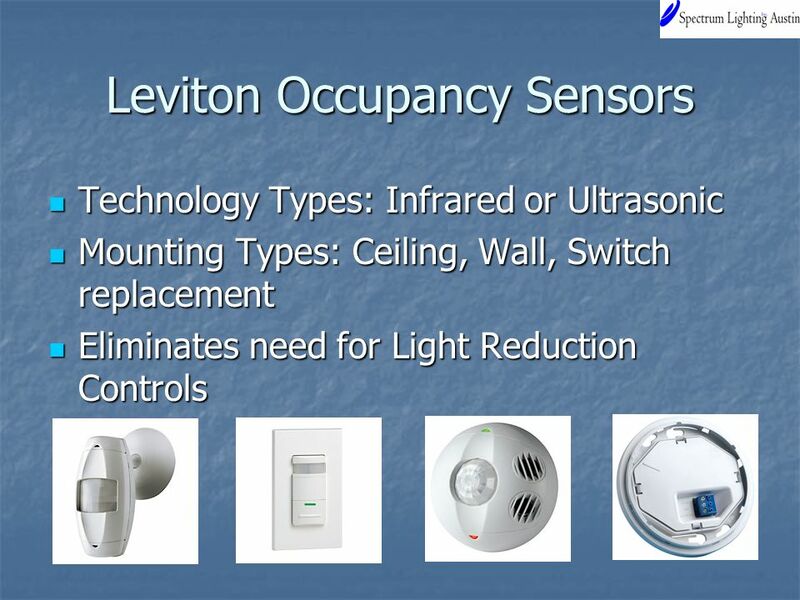 Areas with occupancy sensors. 2. Corridors, storerooms, restrooms, public lobbies. 3. Sleeping units. 4. Spaces with <.6 watts/Ft 2. 16 2006 IECC, Section 505.2 505.2.2.2 Automatic Lighting Shutoff Buildings larger than 5,000 Ft 2 must have an automatic control device 1. Time-of-day scheduling for areas not more than 25,000 FT 2 and one floor, or 2. 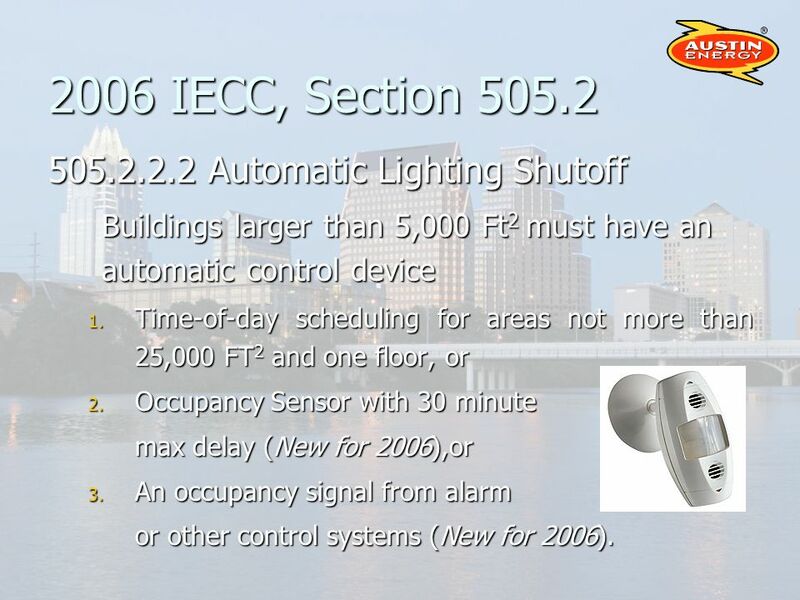 Occupancy Sensor with 30 minute max delay (New for 2006),or 3. An occupancy signal from alarm or other control systems (New for 2006). 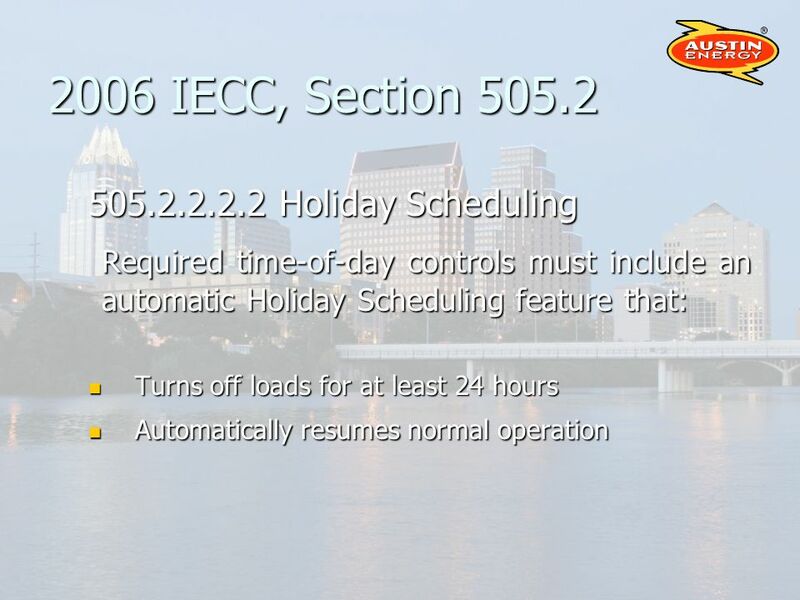 23 2006 IECC, Section 505.2 505.2.2.2.2 Holiday Scheduling (cont.) Exception: Retail stores and associated malls, restaurants, grocery stores, places of religious worship, and theaters. Retail stores and associated malls, restaurants, grocery stores, places of religious worship, and theaters. 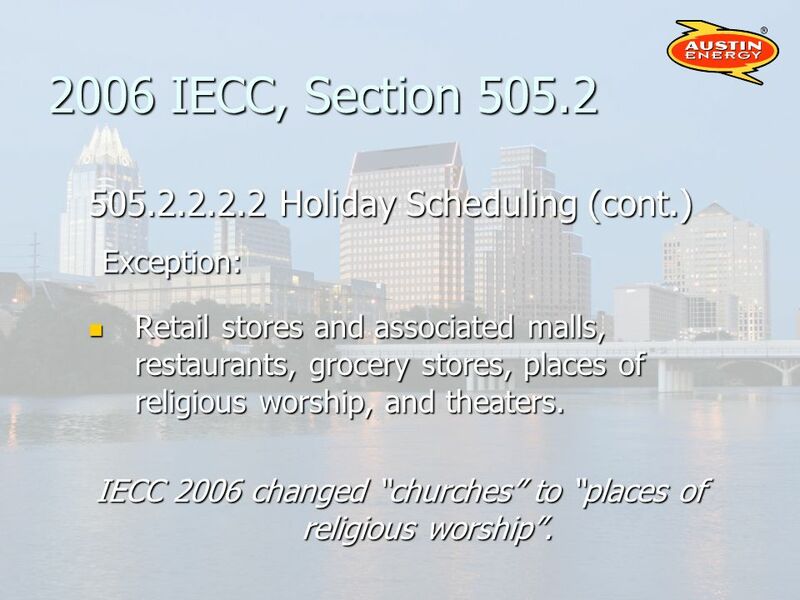 IECC 2006 changed churches to places of religious worship. 24 2006 IECC, Section 505.2 Section 202 GENERAL DEFINITIONS Sleeping Unit. A room or space in which people sleep, which can also provide permanent provisions for living, eating, and either sanitation or kitchen facilities, but not both. Such rooms and spaces that are also part of a dwelling unit are not sleeping units. 28 2006 IECC, Section 505.2 505.2.4 Exterior Lighting Controls (cont.) Lighting not designated for dusk-to-dawn operation must be on an astronomical time clock. Lighting not designated for dusk-to-dawn operation must be on an astronomical time clock. 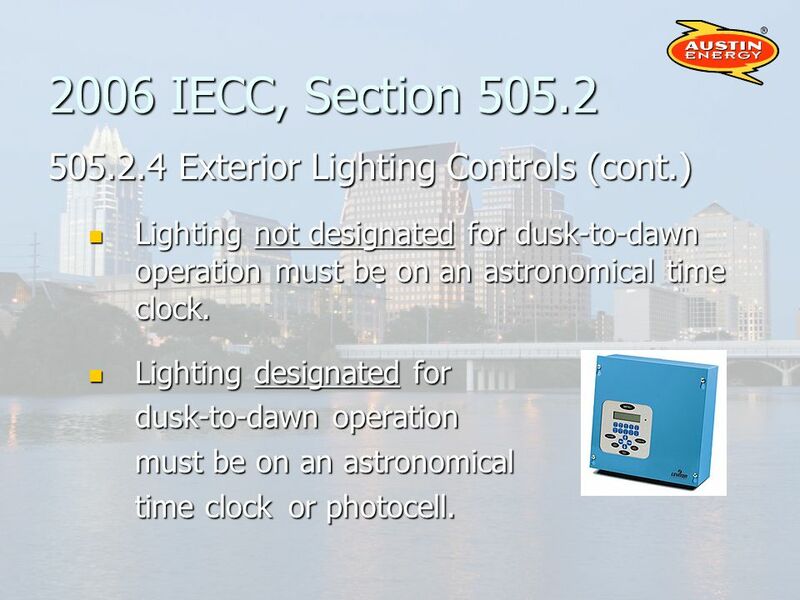 Lighting designated for Lighting designated for dusk-to-dawn operation must be on an astronomical time clock or photocell. 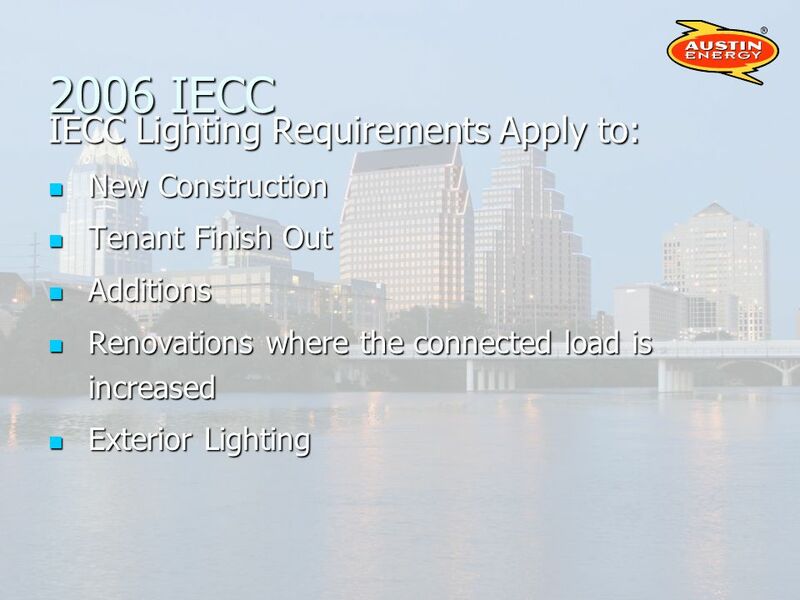 29 2006 IECC, Section 505.2 505.2.4 Exterior Lighting Controls (cont.) 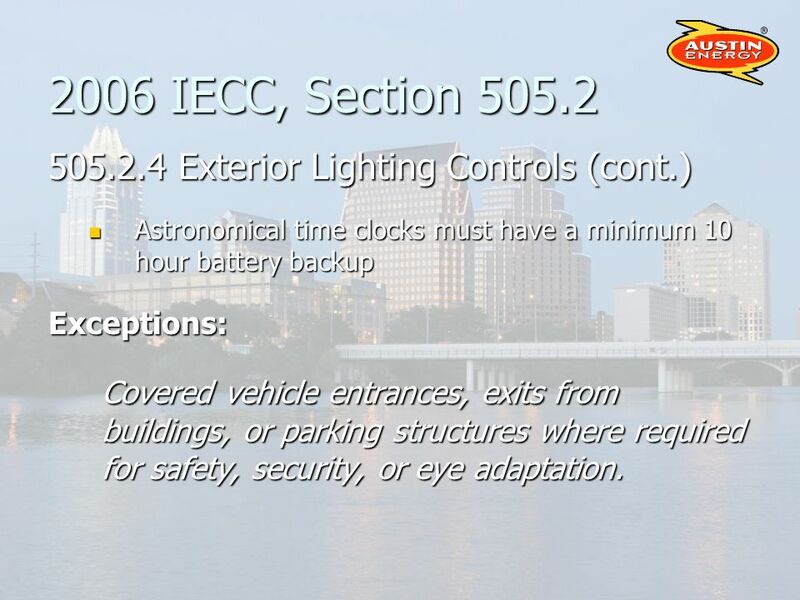 Astronomical time clocks must have a minimum 10 hour battery backup Astronomical time clocks must have a minimum 10 hour battery backupExceptions: Covered vehicle entrances, exits from buildings, or parking structures where required for safety, security, or eye adaptation. 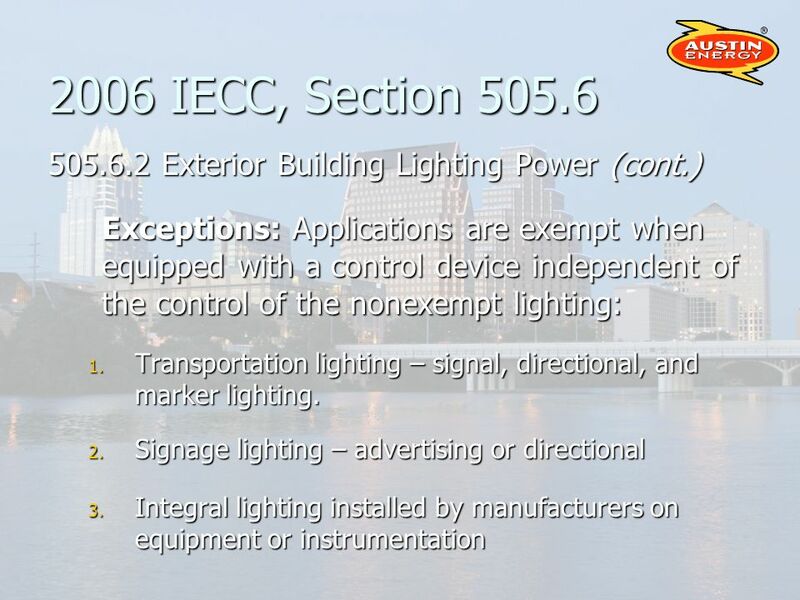 31 2006 IECC, Section 505.2 505.2.4 Exterior Lighting Controls (cont.) 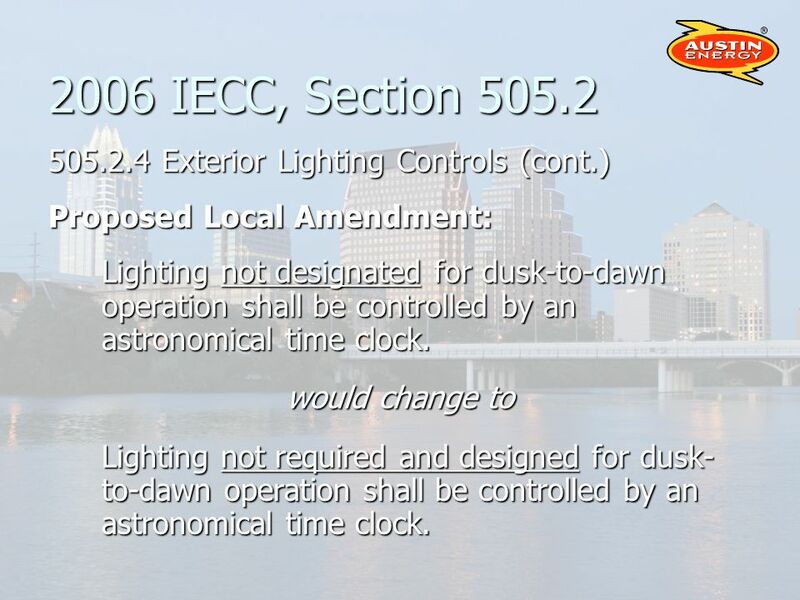 Proposed Local Amendment: Lighting not designated for dusk-to-dawn operation shall be controlled by an astronomical time clock. would change to Lighting not required and designed for dusk- to-dawn operation shall be controlled by an astronomical time clock. 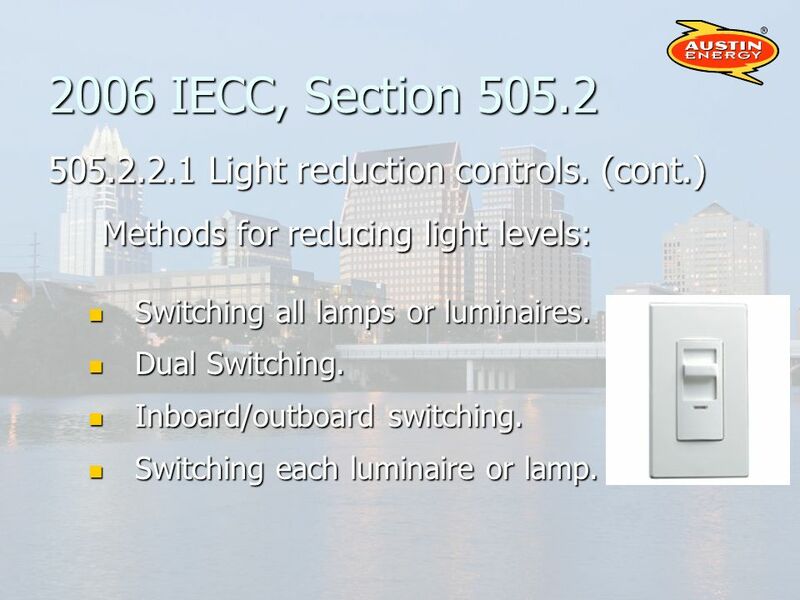 32 2006 IECC, Section 505.2 505.2.4 Exterior Lighting Controls (cont.) 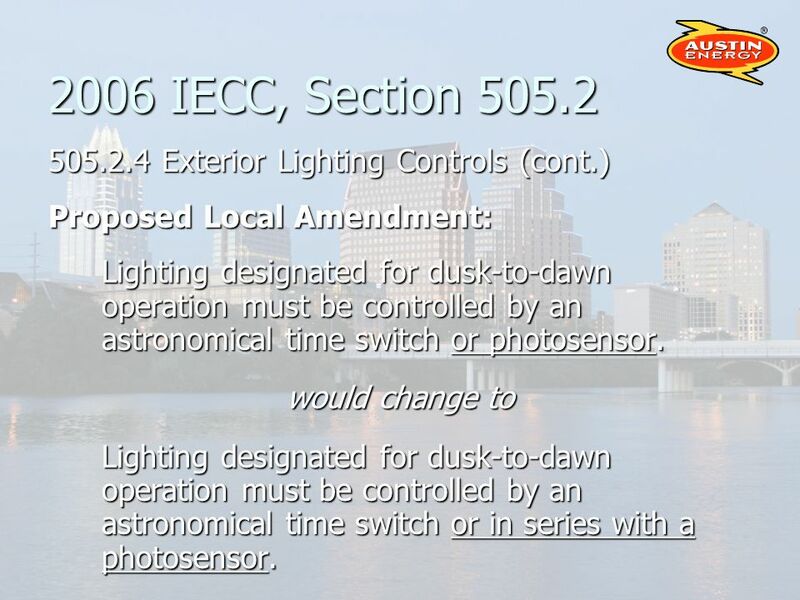 Proposed Local Amendment: Lighting designated for dusk-to-dawn operation must be controlled by an astronomical time switch or photosensor. 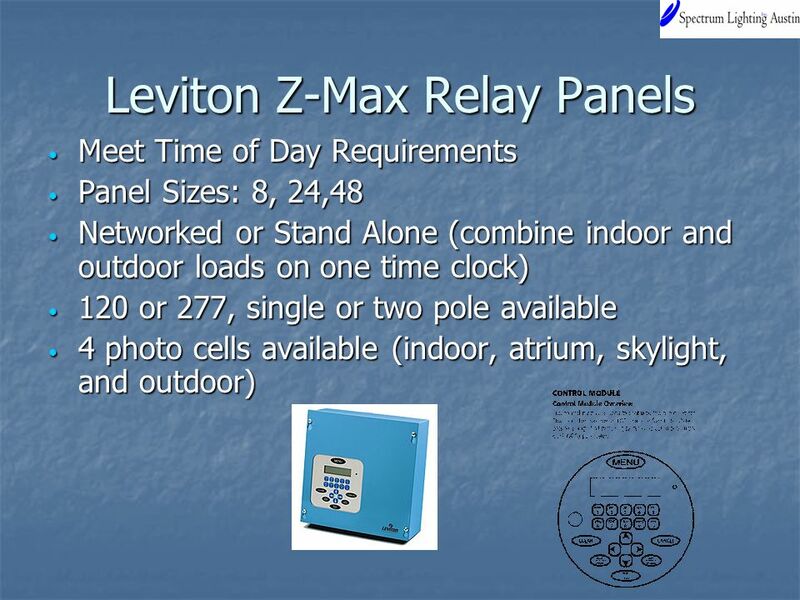 would change to Lighting designated for dusk-to-dawn operation must be controlled by an astronomical time switch or in series with a photosensor. 34 2006 IECC, Section 505.3 505.3 Tandem Wiring (Mandatory) Luminaires must be tandem wired if located in the same area, odd number lamp configuration and: 1. They are recessed mounted and the layout is within 10 Ft on center, or 2. They are pendant or surface mounted within 1 Ft edge to edge of each other. 36 2006 IECC, Section 505.4 505.4 Exit Signs (Mandatory) Internally illuminated exit signs may not be more that 5 watts/side. 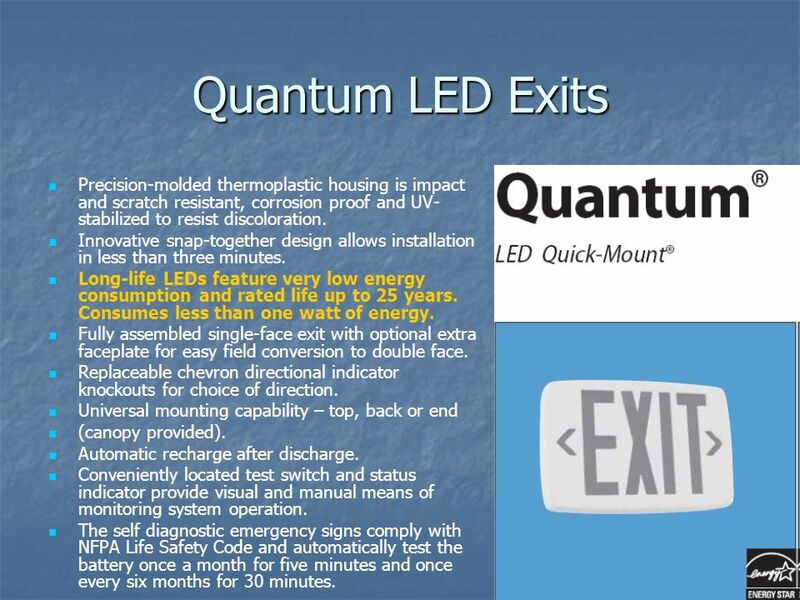 37 Quantum LED Exits Precision-molded thermoplastic housing is impact and scratch resistant, corrosion proof and UV- stabilized to resist discoloration. Innovative snap-together design allows installation in less than three minutes. 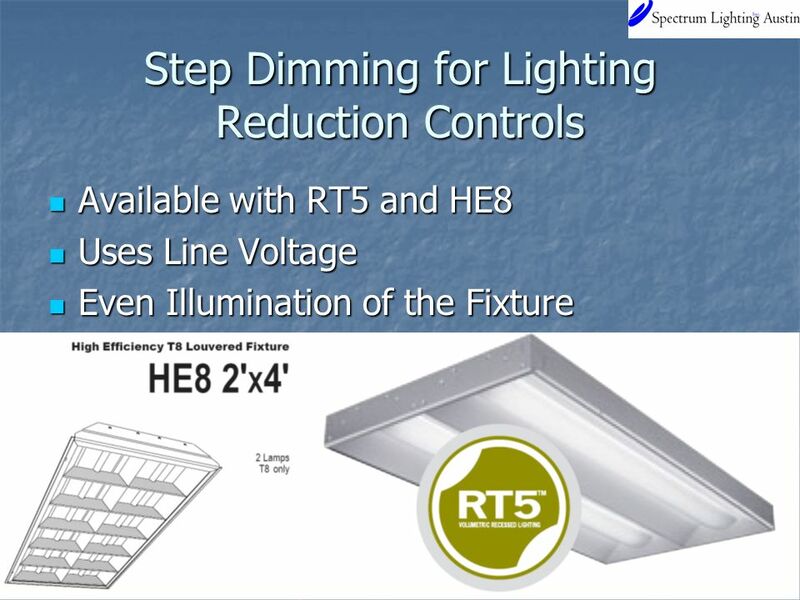 Long-life LEDs feature very low energy consumption and rated life up to 25 years. Consumes less than one watt of energy. Fully assembled single-face exit with optional extra faceplate for easy field conversion to double face. Replaceable chevron directional indicator knockouts for choice of direction. Universal mounting capability – top, back or end (canopy provided). Automatic recharge after discharge. Conveniently located test switch and status indicator provide visual and manual means of monitoring system operation. The self diagnostic emergency signs comply with NFPA Life Safety Code and automatically test the battery once a month for five minutes and once every six months for 30 minutes. 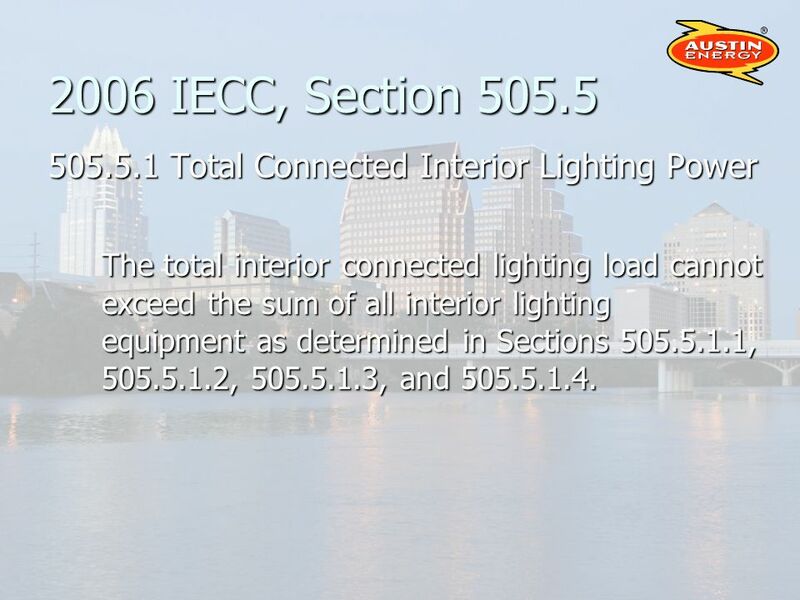 39 2006 IECC, Section 505.5 505.5.1 Total Connected Interior Lighting Power The total interior connected lighting load cannot exceed the sum of all interior lighting equipment as determined in Sections 505.5.1.1, 505.5.1.2, 505.5.1.3, and 505.5.1.4. 42 2006 IECC, Section 505.5 505.5.1.1 Screw Lamp Holders The wattage shall be the maximum labeled wattage of the luminaire. 43 2006 IECC, Section 505.5 505.5.1.2 Low-voltage Lighting The wattage shall be the specified wattage of the transformer supplying the system. 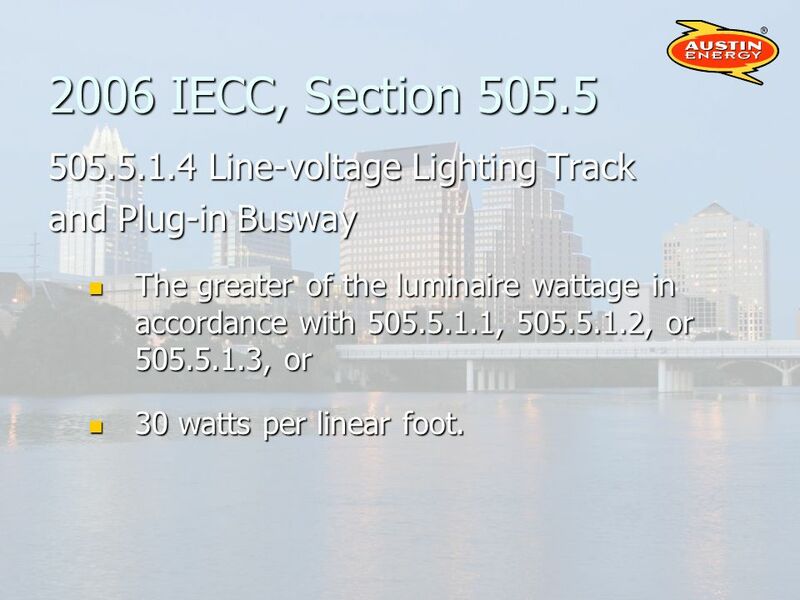 45 2006 IECC, Section 505.5 505.5.1.4 Line-voltage Lighting Track and Plug-in Busway The greater of the luminaire wattage in accordance with 505.5.1.1, 505.5.1.2, or 505.5.1.3, or The greater of the luminaire wattage in accordance with 505.5.1.1, 505.5.1.2, or 505.5.1.3, or 30 watts per linear foot. 30 watts per linear foot. 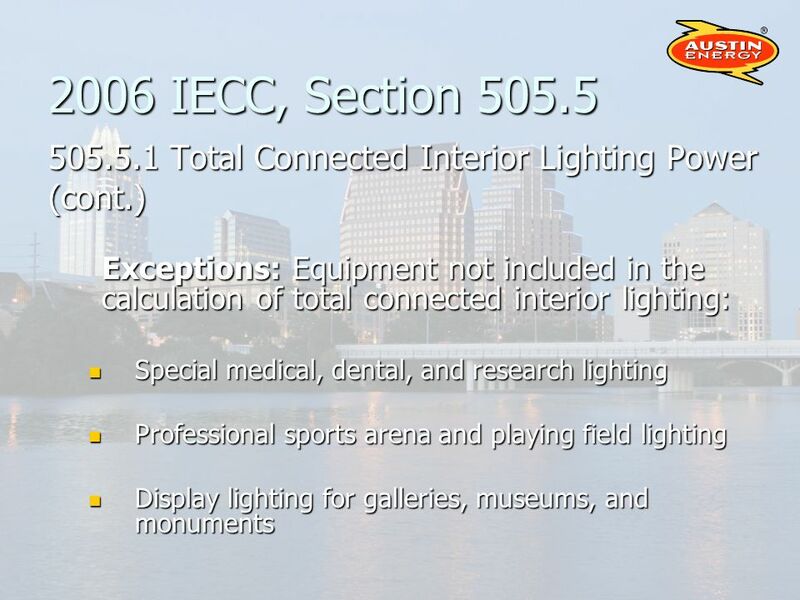 46 2006 IECC, Section 505.5 505.5.2 Interior Lighting Power (Revised for 2006) The total interior lighting power is the sum of all interior lighting powers for all of the areas in the building covered by the permit. 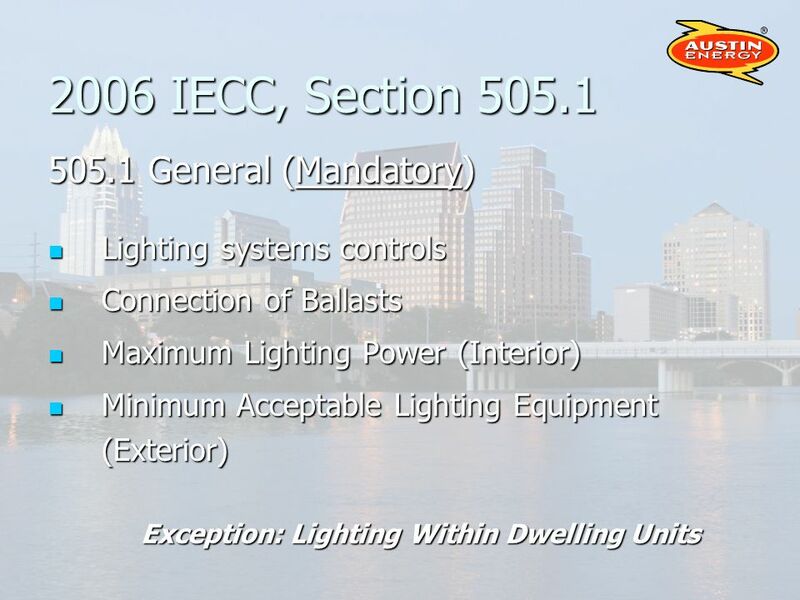 The total interior lighting power is the sum of all interior lighting powers for all of the areas in the building covered by the permit. 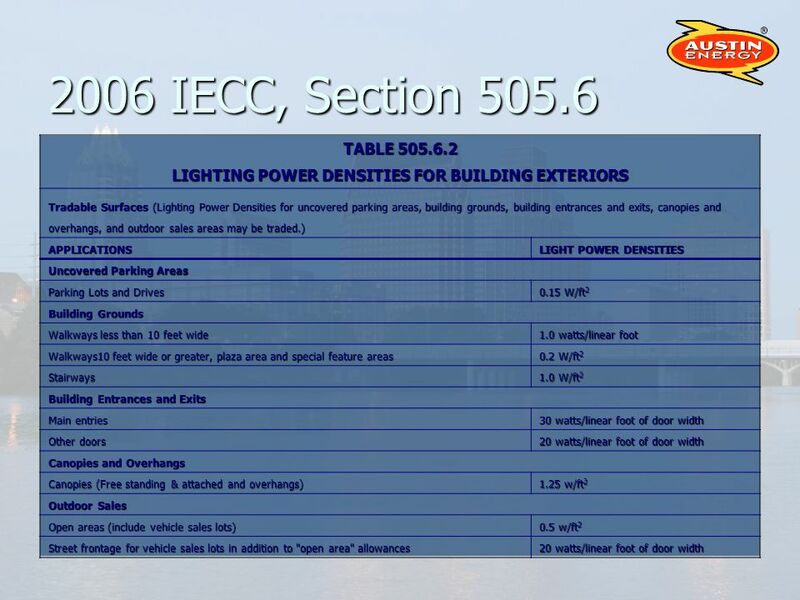 The interior lighting power is the floor area for each building area times the value listed in Table 505.5.2. 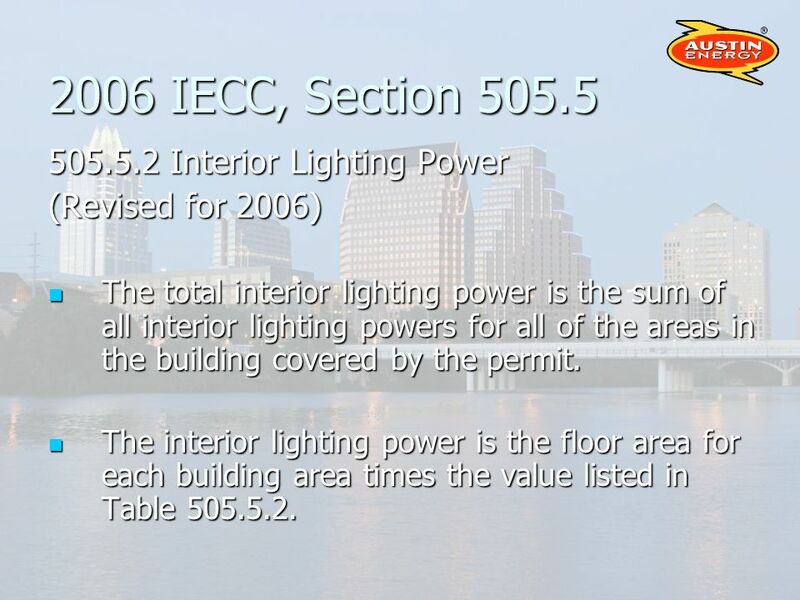 The interior lighting power is the floor area for each building area times the value listed in Table 505.5.2. 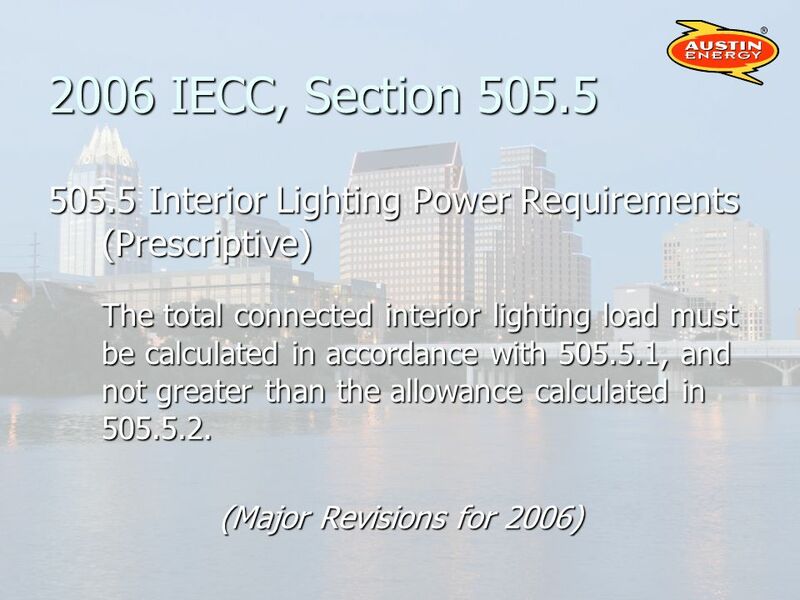 47 2006 IECC, Section 505.5 505.5.2 Interior Lighting Power (cont.) 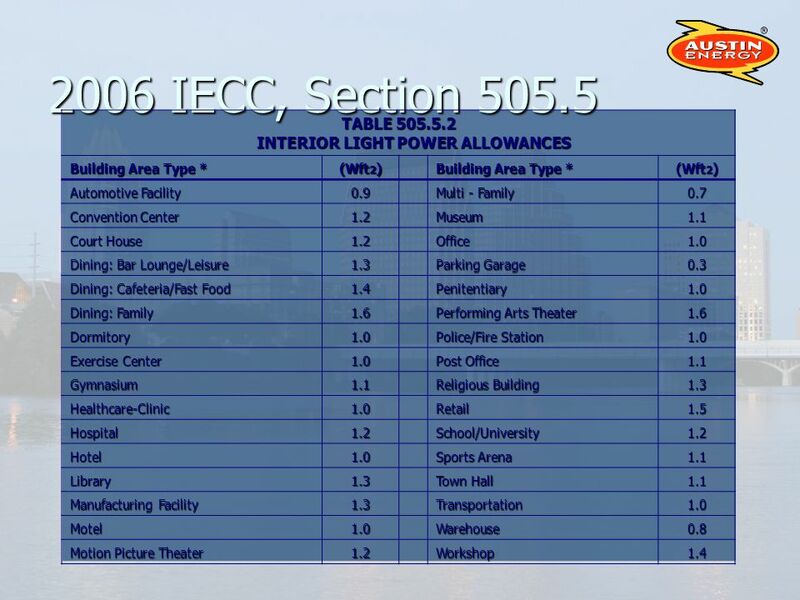 Areas are contiguous spaces in a single building as listed in Table 505.5.2. 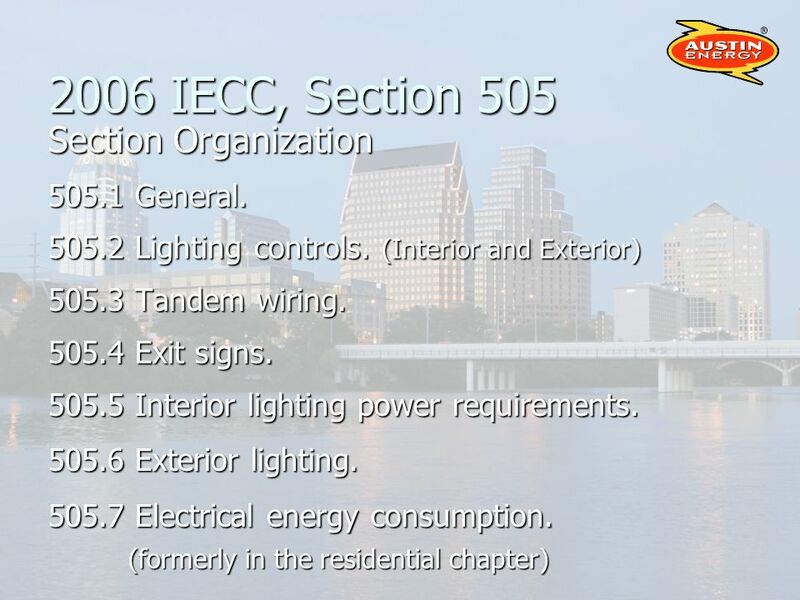 Areas are contiguous spaces in a single building as listed in Table 505.5.2. Each building area type shall be treated as a separate building area. Each building area type shall be treated as a separate building area. NOTE: The entire building method has been deleted for 2006. 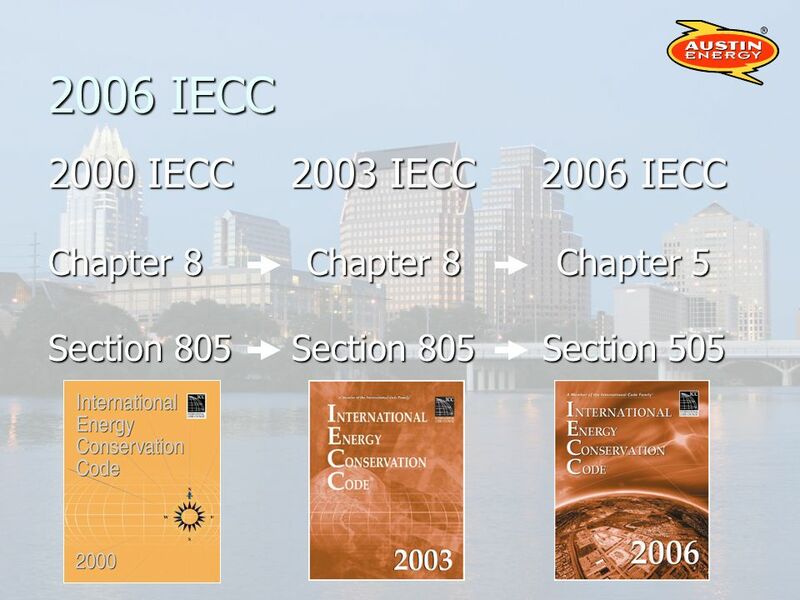 52 2006 IECC, Section 505.5 Table 505.5.2 a. If a general area type and a specific area type are both listed, the more specific area type applies. b. For separately switched and circuited merchandise lighting, the lesser of the actual wattage, or 1.6 watts/Ft 2 times the display area applies. Cant exceed 50% of the floor area Cant exceed 50% of the floor area 3.9 watts/Ft 2 for the case or shelf area may be added for displaying jewelry, china, or silver. 3.9 watts/Ft 2 for the case or shelf area may be added for displaying jewelry, china, or silver. 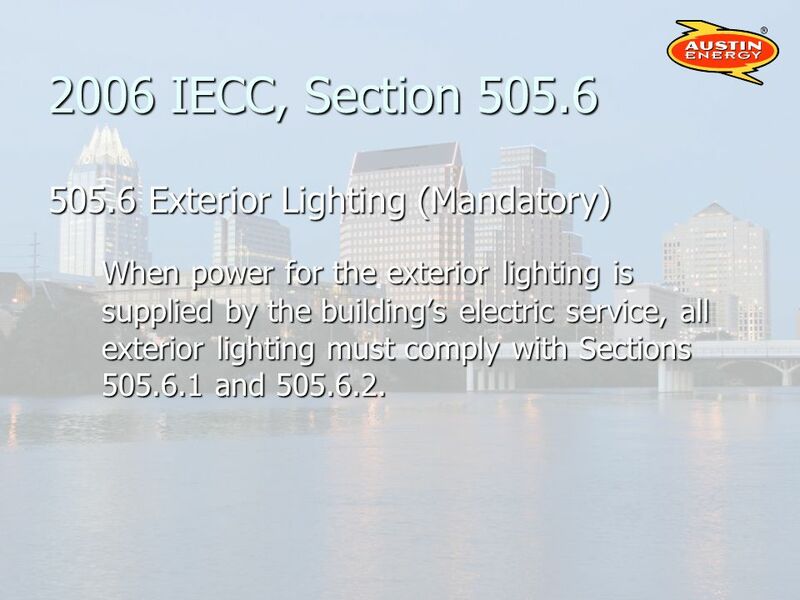 53 2006 IECC, Section 505.6 505.6 Exterior Lighting (Mandatory) When power for the exterior lighting is supplied by the buildings electric service, all exterior lighting must comply with Sections 505.6.1 and 505.6.2. 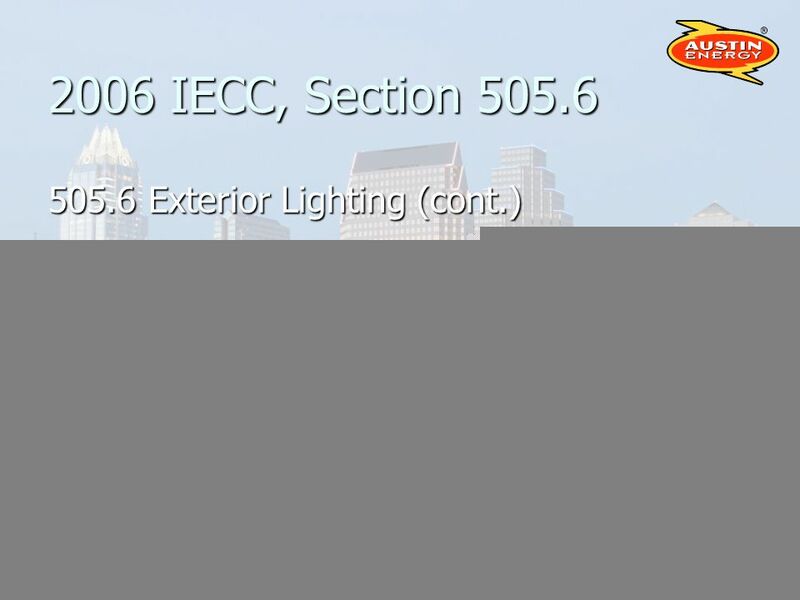 54 2006 IECC, Section 505.6 505.6 Exterior Lighting (cont.) Exceptions: Low voltage landscape lighting, Low voltage landscape lighting, Where approved because of historical, safety, signage or emergency considerations. Where approved because of historical, safety, signage or emergency considerations. 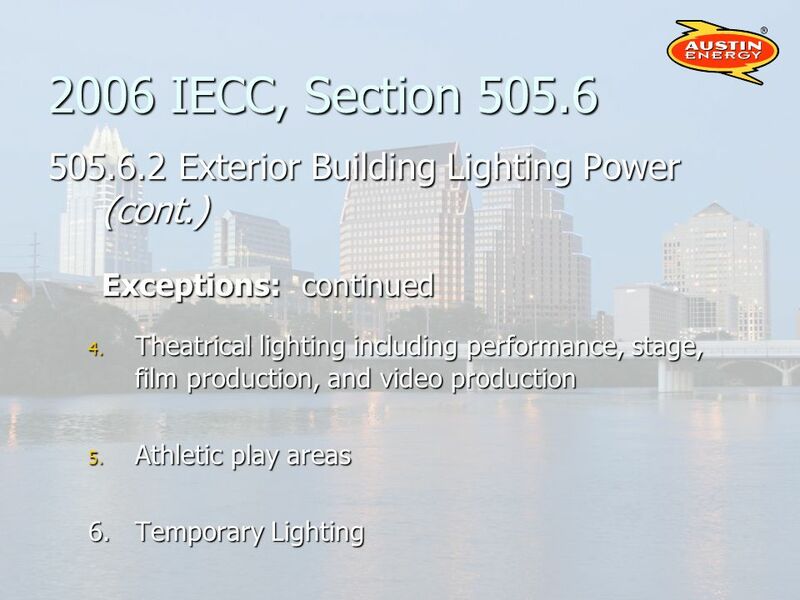 56 2006 IECC, Section 505.6 505.6.2 Exterior Building Lighting Power (New for 2006) The total exterior lighting power allowance is the sum of the power densities permitted in Table 505.6.2 for the applications, plus an additional unrestricted 5%. The total exterior lighting power allowance is the sum of the power densities permitted in Table 505.6.2 for the applications, plus an additional unrestricted 5%. 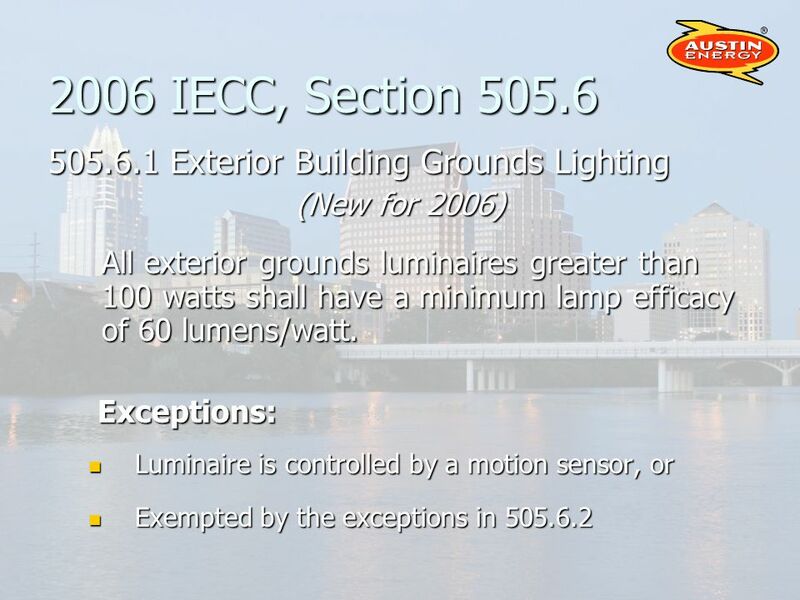 Tradeoffs are allowed only among exterior lighting applications in the Tradable Surfaces Section of Table 505.6.2. 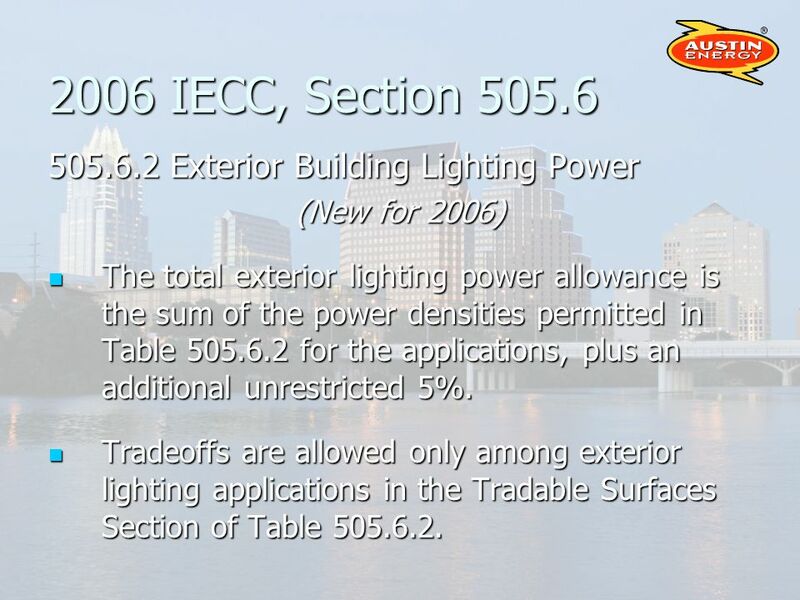 Tradeoffs are allowed only among exterior lighting applications in the Tradable Surfaces Section of Table 505.6.2. 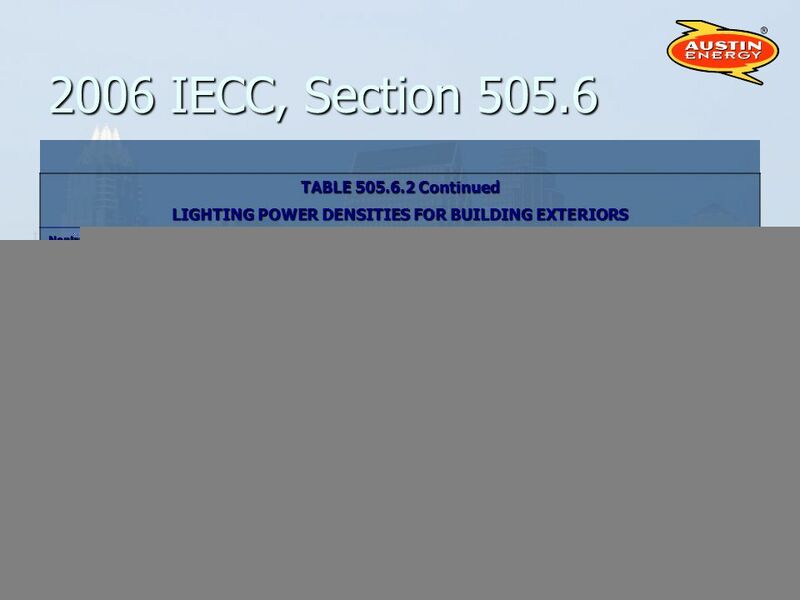 61 2006 IECC, Section 505.6 505.6.2 Exterior Building Lighting Power (cont.) Exceptions: continued 7. Industrial production, material handling, transportation sites, and storage areas 8. Theme and amusement parks 9.Highlighting for public monuments and registered historic structures or buildings. 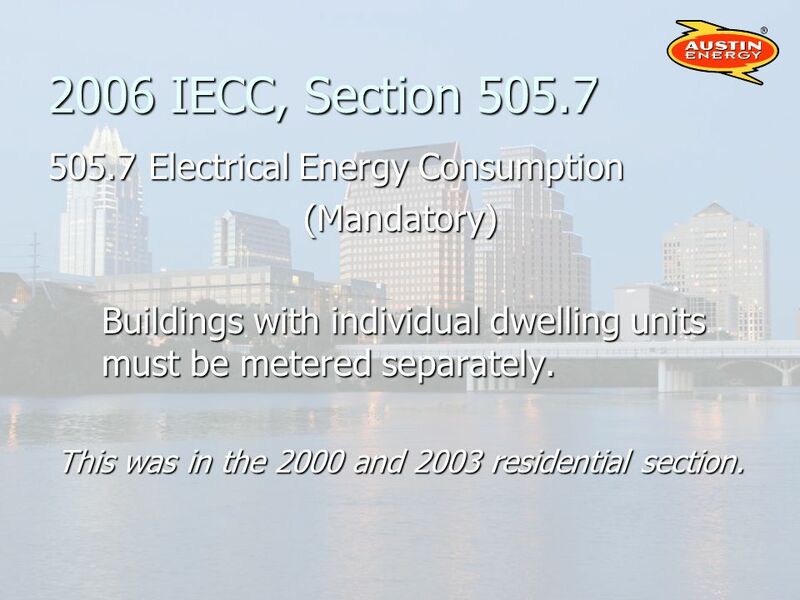 62 2006 IECC, Section 505.7 505.7 Electrical Energy Consumption (Mandatory) Buildings with individual dwelling units must be metered separately. This was in the 2000 and 2003 residential section. 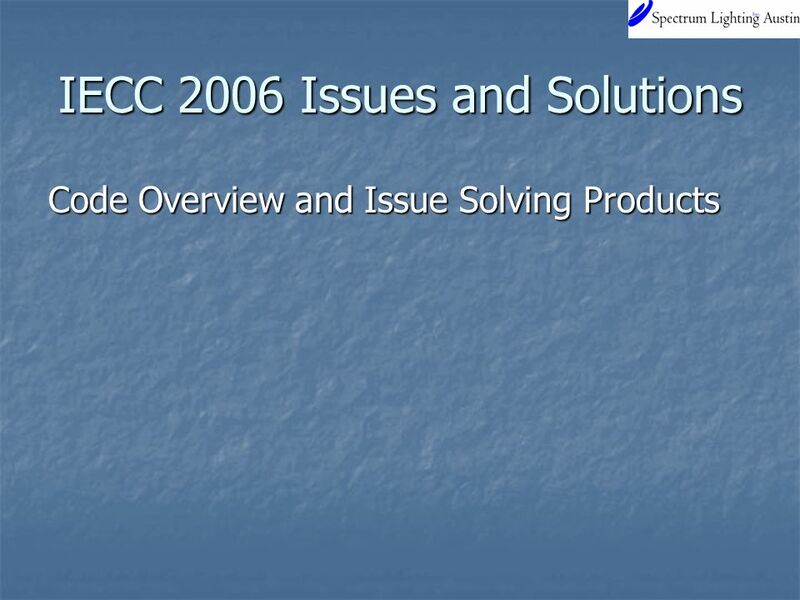 Download ppt "IECC 2006 Issues and Solutions Code Overview and Issue Solving Products." 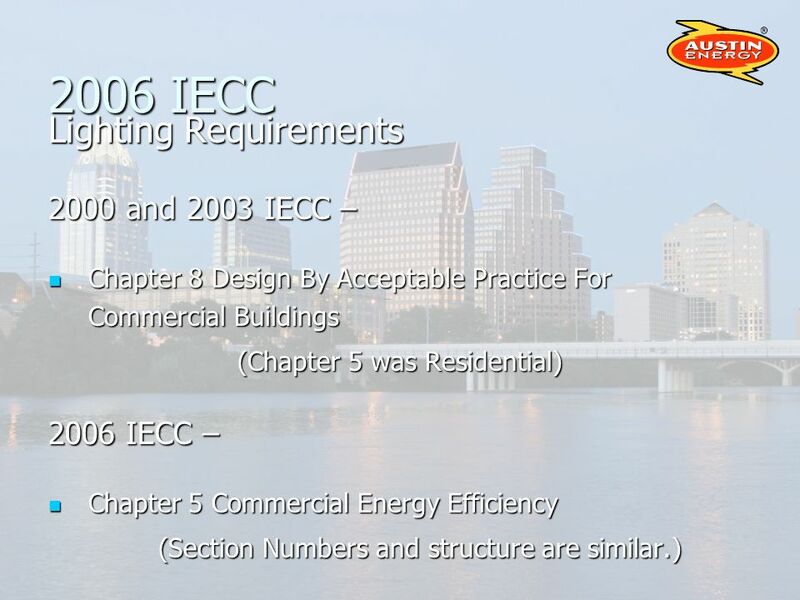 The Iowa State Building Code and Its Application. Helping Massachusetts Municipalities Create a Greener Energy Future Code Informational Session November 13, 2013. 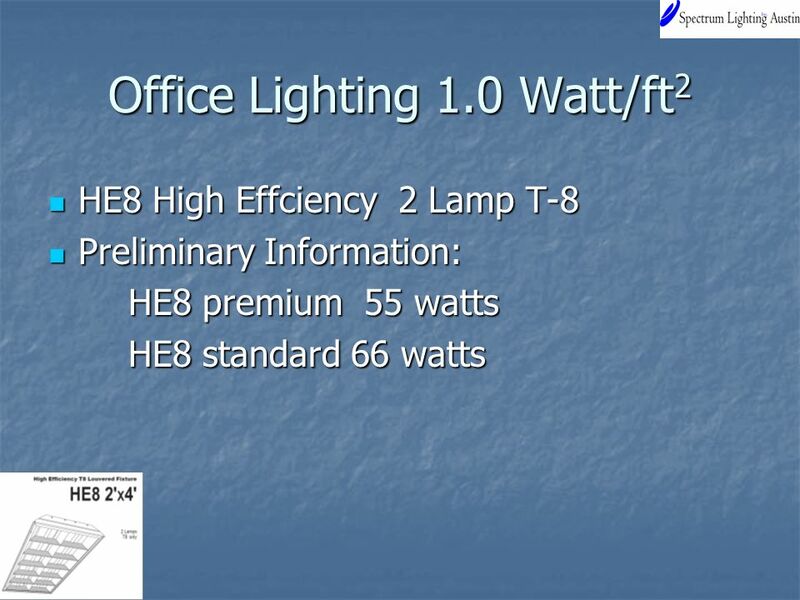 Lighting Tax Deduction The Energy Efficient Commercial Buildings Tax Deduction. 2009 versus 2012 IECC Maryland Affordable Housing Coalition June 26th, 2012. State of Virginia’s Adoption Uniform Statewide Building Code –Adopts model codes by reference Family of I Codes 2003 edition NEC 2002 edition –Statewide. Accessibility.  A building code is a set of rules that specify the minimum acceptable level of safety for buildings. The main purpose of building codes.